Can a turkey baster help you achieve healthy, thriving corals and a relatively algae free tank? Thanksgiving is nearly upon us here in the USA. Our thoughts … at least MY thoughts, turn not only to what I am grateful for but also to seeing family and eating the feast of Thanksgiving. At my table there will be turkey-a-plenty, red velvet hash, honeyed carrots, and a plethora of salads and other vegetable dishes. Then there are the desserts! Ah, I love Thanksgiving; for food and for the family that I may only see at Thanksgiving. Hopefully, for the rest of you, your Thanksgiving will be similar to mine; Family, friends, good food and hopefully, the blessings of good times. For many however, Thanksgiving also means the only time of year you will use a turkey baster. I want to encourage all of you to go out today and purchase an extra turkey baster. You see, the humble turkey baster is one of the best friends an aquarist can have. I use a turkey baster on a daily basis … not to baste turkey but to keep my live rock detritus free! Submerge your turkey baster in your aquarium and fill it with water, it makes the perfect detritus remover! Just place the tip of your baster in a hole in the live rock and give the bulb a little squeeze. WOW! Look at those puffs of smoke that emanate from all over the live rock. Well my friends, those puffs of smoke are actually clouds of detritus that were settled in the small crags and crevasses of your rock. Left unattended, these deposits would continue to build and soon they would have contributed to poor water quality and become food for algae. I also use my turkey baster to puff gentle streams of water around the bases of corals and across the surface of live rock. The return I get from such a simple little procedure is healthy, thriving corals and a relatively algae free tank. Gentlemen, do not use your wife’s turkey baster from the kitchen. You will regret it if she catches you doing it! I got my “Aquarium-Use Only” baster at the dollar store for about a buck ninety-nine. 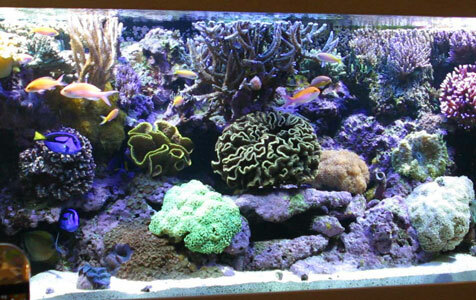 I offer this as a sensible investment for both your aquarium maintenance equipment and for peace in your home.